I've never seen my dad light up like he does around my son. Bug is his first and only grandchild, and I think it's safe to say that he loves him. I knew I wanted to give my dad a special picture of the two of them for his birthday. 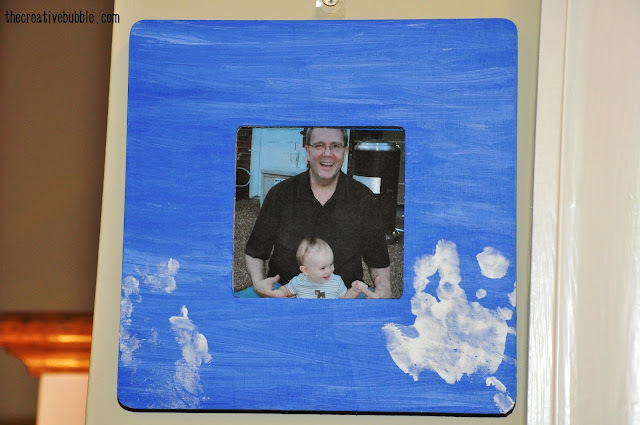 Bug was eight months old at the time, but I thought I might chance trying to get a couple hand prints for a hand painted picture frame. Who doesn't like a set of tiny, adorable hand prints? I bought the wood frame from Michael's for a great price, and already had the acrylic paints. Boys like blue, so I thought it was a safe color to use. I added some white streaks to break it up a bit. Then, I painted Bug's baby hands. This was the hard part. He did not like having paint on his hands (I don't blame him). It was the best I could do to get one decent print. I could have painted over the "bad" print and redone it, but it wasn't worth it to put him through that again, and now the frame has even more character. "Hand prints from a wild 8mo old boy." It's hanging in my parents' kitchen, and serves as a great reminder of how fast Bug is growing! He loves his grandpa (or "Bapa" as he calls him nowadays). This project was very easy and inexpensive to make (don't tell my dad). I think it's a perfect, little gift for someone...especially a grandma or grandpa. LOVE hand/footprint stuff. I did a poem with her tiny feet print for her daddy on his first fathers day this year. And for grandparents day I bought clay, put her handprint in it, added her name at the bottom in beads, and then baked it. When it was cool, I painted the handprint in pink. Turned out great!! My trick- I got her hand and footprints while she was napping. A bit messy but the Prints came out really good! I LOVE all your ideas and DIY stuff on here KT!! !